House Republicans released a set of broad “standards” for immigration reform Thursday that would allow many undocumented immigrants to “get right with the law” and live legally in the United States if they meet a set of stringent requirements and if tough border security triggers are met. 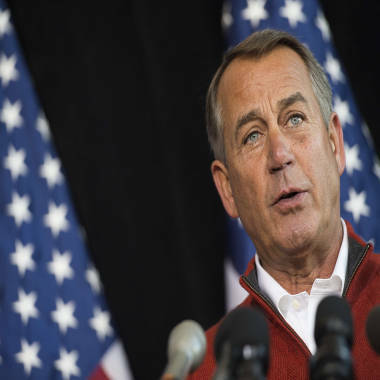 Speaker of the House John Boehner (R), R-Ohio, speaks during the House Republican Leadership press conference at the House Republican Issues Conference in Cambridge, Maryland, January 30, 2014. But the draft also offered a potential blueprint for how most of the nation’s estimated 11 million undocumented immigrants can “come out of the shadows” and live without the threat of deportation. The draft does not say whether undocumented immigrants who obtain that probationary legal status will be eligible for green cards or eventual citizenship, but it does encourage a path to citizenship for undocumented children who were brought into the country at a young age. House Speaker John Boehner presented the principles in a closed-door meeting Thursday, saying that reform is necessary for economic growth and national security. A source in the room said that Boehner warned that the standards are "as far as we are willing to go" and that negotiations will fall apart if Democrats demand "a special path to citizenship." Forging such legislation will be a high-wire act for pro-reform House Republicans, who are mindful that their support from Latinos will likely continue to shrink if they are perceived as jamming an overhaul of outdated laws. A sizable block of conservatives are resisting those proposed changes, saying that such “amnesty” would be unfair to American workers and legal immigrants. Rep. Paul Ryan joins Chuck Todd to give his reaction on the State of the Union and talk about the Republican retreat, where they will circulate a framework for legal status, but not citizenship, for undocumented immigrants. Opponents like Sessions say that an influx of new legal workers would flood the labor market and drive up American unemployment. And some of the most strident critics of the Obama administration argue that – even if any new law included tough requirements for border security before legalization could go into effect – the federal government can’t be trusted to enforce the law." Even if the GOP leadership proposal garners support from a majority of Republicans in the GOP-dominated House, however, it faces an additional test: whether it goes far enough for Democrats. Many longtime Democratic advocates of immigration reform say that any proposal that bars undocumented workers from eventually obtaining citizenship – either directly or by requiring unrealistic border security criteria to be met before the citizenship process can begin -- would be unacceptable. AFL-CIO president Richard Trumka called the draft a "flimsy document that only serves to underscore the callous attitude Republicans have toward our nation’s immigrants." "Half-measures that would create a permanent class of non-citizens without access to green cards should be condemned, not applauded," he wrote. Democratic Sen. Chuck Schumer of New York, a leader in the Senate's passage of a comprehensive immigration bill last year, was more optimistic. "While these standards are certainly not everything we would agree with, they leave a real possibility that Democrats and Republicans, in both the House and Senate, can in some way come together and pass immigration reform that both sides can accept. It is a long, hard road but the door is open," he said in a statement. President Barack Obama offered few specifics in his State of the Union address, giving Republicans a wide berth as they begin their discussions.